Every time I play some of my music loud, I hear, somewhere in the back of my head, the voices of my father and mothing saying "Turn your music down!" I still listen, today, to the groups I listened to in the 1970s; The Doobie Brothers, Boston, Yes, The Moody Blues, Fleetwood Mac or almost anything referred to today as Classic Rock. I also like good One Hit Wonders, most of the 1980s music and Contemporary County. It's what my kids listen to that I can't stand. I'm channeling the voices of my parents, when I yell, "Turn that crap down!" I'm not as polite as were my parents. I truly believe that much of today's music is nothing but loud noise, especially the Hip-hop and Rap, aka rhythm and poetry, which I will never understand. I ask Michelle, my daughter, why she likes that stuff. All I get is a shrug and an eye roll. We saw that show about two years ago, so my wife doesn't understand why she wants to see it again. She says, rather loudly, "Mom! Brendan Urie is now in the show! I love him!" If it were up to me, I'd get the cheap seat tickets and go see the show again with her. It's amazing how a pair of $45 tickets turns into a $200 day when you add in transportation and food. That's what my wife is objecting to, mostly. The music at work repeats every three hours. Anyway, at work, we have a variety of music channels delivered by Direct TV. For us older folks, we prefer the 70s and 80s channel or a mix of everything. 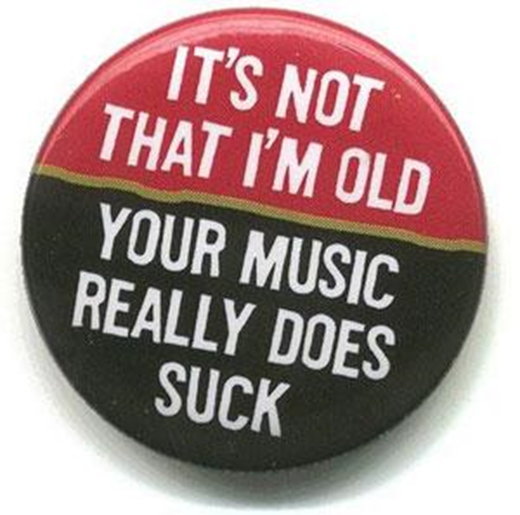 The younger people like today's Top 40. The problem with that channel is that it repeats every 3 hours. I swear to gawd, if I heard Joe Jonas, sing Chains, one more time, my head is going to explode. You can listen just so many times to the same song, without getting mad. My manager sent me text this morning that he put on the 80s channel. Oh yeah, well someone changed it to the crappy channel we don't like. No response to that; I guess he was afraid of what I might do. Give me the keys to that room and I'll find a channel everyone can live with. I like some newish artists; Bruno Mars, Walk the Moon and Taylor Swift. Those that I truly detest are Justin Bieber, One Direction and Miley Cyrus. I can understand if you're a 10-to-16 year old girl and they like that stuff. My demographic does not. I have a lot of music stored on my phone, mostly classic rock, country and many of my favourite One Hit Wonders. I'll add some new stuff from groups that I like, including Train. They've been around a long time, and are now a staple of Adult Contemporary radio. Just waiting for the new Jimmy Buffett song. If you see me with my ear buds in and my head bopping, just leave me alone. I'm enjoying my music on shuffle. I’m just waiting for the next Jimmy Buffett song to appear.